Mr Kearns was involved in establishing ‘Cairde Ospideal na Gaillimhe’ a charitable group who aim to provide extra patient and family comforts to the people of University Hospital Galway. The group’s inaugural event was held in the Ardilaun Hotel November 26th 2015 and raised over €16,000 for the hospital. 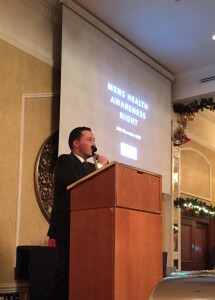 Mr Kearns was one of the key note speakers on a night that centred on Men’s Health Awareness. Dr. Darren Mylotte – Consultant Cardiologist, Dr Francis Finucane – Consultant Endocrinologist and Mr. Killian Walsh – Consultant Urologist were all kind enough to give their time on the night and were well received by the evening’s delegates. A Female Health Awareness Night is planned for May 19th and hopes to raise more much needed funds for such a good cause. The charity hopes to redecorate the family room in the University Hospital and also hopes to establish a shuttle service between units in Merlin Park.